Allen Jerkens dropped back to pass. His son Steve was in the open briefly, but the ball was knocked down at the last minute by jockey Richard Migliore. Jerkens, visibly upset at himself for waiting too long to throw, uttered a few choice words of displeasure, then promptly called the next play. God forbid if he threw a perfect pass and you dropped it. You might as well have kept running, and that included his owner and main client Jack Dreyfus. That was how competitive Allen Jerkens was, whether it was running a horse in grade I stakes or a $5,000 claimer or playing a game of touch football on the horse path outside his barn leading to the training track. That scene, played out several times a week with his sons Jimmy and Steve, Dreyfus, and trainers, jockeys, exercise riders, and grooms, was typical of the unorthodox nature of Allen Jerkens, who never did anything by the book. He was an island unto himself and his shores were always open to anyone, whether millionaires or paupers. And one of the many legacies he left in seven decades of training horses was his ability to turn equine paupers into millionaires. Jerkens paid no attention to how blue a horse’s blood was. He made stars out of them all. And he rarely had blue bloods to work with. It would take volumes upon volumes to capture the essence of Allen Jerkens, as there were so many aspects of his personality, his horsemanship, and his genius it is difficult to know where to begin. For many, it is always best to start at the end by listing their career statistics and achievements. But that is the last place you would start with Jerkens, who never won a Triple Crown race and never won a Breeders’ Cup race, and that in itself says so much about the man and the pedestal on which everyone placed him. His career was more a kaleidoscope of unforgettable images and titanic feats, and about caring for people, all of which form an everlasting chronicle of Thoroughbred racing. To Jerkens, the Sport of Kings was not about kings at all. It was about everyday people and everyday horses, and a pure love of racing and the competitiveness it inspires. Jerkens was an emotional person who brought out emotions in all those he came in contact with. It was a common sight to see Jerkens weep openly in the winner’s circle following a victory – not for himself or his owners, but for the horse who had just reached into his or her heart and given 100 percent. Yes, Jerkens’ overall statistics are impressive. He trained 3,859 winners of nearly $104 million, placing him 11th and 14th, respectively, among trainers all-time, and became the youngest trainer, at age 45, to be inducted into the Hall of Fame. But as everyone knows, his reputation is not based so much on how much money he won or what races he won, but who he beat. Although he disliked the term “Giant Killer,” which followed him throughout his career, the fact is, the list of giants he slew reads like a Who’s Who of Thoroughbred racing. In addition to defeating the great Kelso three times with Beau Purple (in the Suburban and Widener Handicaps and Man o’War Stakes) and the legendary Secretariat with Onion (in the grade I Whitney Handicap) and Prove Out (in the grade I Woodward Stakes), Jerkens upset Buckpasser (7-10) with Handsome Boy ($12.60) in the Brooklyn Handicap; Riva Ridge (1-2) with Prove Out ($11) in the Jockey Club Gold Cup; Forego (2-1) with Step Nicely ($17.40) in the Jerome Handicap; Cicada (2-5) with Pocasaba ($21.40) in the Black Helen Handicap; Numbered Account (4-5) with Blessing Angelica ($11.80) in the Delaware Handicap; Summer Guest (4-5) and Numbered Account (9-5) with Poker Night ($11.20) in the Top Flight Handicap; Numbered Account (3-10) with Poker Night ($8) in the Bed ‘o Roses Handicap; Malicious (7-10) with Winnie ($14.20) in the Gravesend Handicap; Wajima (3-10) with Group Plan ($14.40) in the Jockey Club Gold Cup; Fanfreluche (3-5) with Taken Aback ($16.40) in the Spinster Stakes; Moccasin (2-1) with Mac’s Sparkler ($10.40) in the Columbiana Handicap; Straight Deal (6-5), with Mac’s Sparkler ($9.20) in the Black Helen Handicap; Straight Deal (7-10), Gamely (9-2), and Lady Pitt (5-1) with Mac’s Sparkler ($18.80) in the Beldame Stakes; and Temperence Hill (2-1) with Hechizado ($14.40) in the Brooklyn Handicap, and Skip Away (1-5) with Wagon Limit ($70) in the Jockey Club Gold Cup. Almost every one of the horses mentioned above that Jerkens defeated was a champion. And eight of the horses he defeated are in the Hall of Fame. As recently as 2012, Jerkens upset 1-5 favorite Agave Kiss with 39-1 Emma’s Encore in the grade III Victory Ride Stakes. And once again the tears flowed. He always tried his best to hold them back, but always failed. In 1973, he may have had, in his own way, the greatest year ever by a trainer. When the year started, Onion had won only four-of-11 starts in allowance company; Prove Out had won only four races (a maiden and three allowance races) in 27 starts with Buddy Hirsch, finishing out of the money 17 times; Vertee had earned only $20,000 in his entire career; Poker Night had been running in $13,000 maiden claiming races; Step Nicely had broken his maiden in an $18,000 claiming race; and King’s Bishop was a solid OK stakes horse in the Midwest, trained by T.J. Kelly. By the end of the year, all six horses had won the equivalent of grade I stakes for Jerkens, defeating the likes of Secretariat, Riva Ridge, Forego, and Numbered Account. Jerkens’ career has always existed in a different realm than other trainers. He rewrote the meaning of the word unconventional, and simply put, did things differently than anyone else. He had to, because his stable was unlike anyone else’s. It usually was made up of a ragamuffin group of misfits and castoffs, most of which were owned by his longtime friend Jack Dreyfus, who was every bit as unconventional as Jerkens. Either Dreyfus was a genius at breeding unknown stallions to unknown mares or he hired a genius when he hired Jerkens. They truly were racing’s Odd Couple, but together they struck fear in every trainer and owner who sent a favorite to the post. Even in his seventh decade of training and having only a handful of mediocre horses, Jerkens still was the most revered trainer in the country and idolized by those who now dominate the sport. To demonstrate how unconventional Jerkens’ training methods were, two days before the Suburban Handicap, Jerkens worked Beau Purple a mile in 1:37 and galloped out 1 1/8 miles in 1:50. Two days later, Beau Purple went out and beat Kelso by 2 1/2 lengths, equaling the track record. Jerkens has always said there is no great secret to upsetting champions. “Great horses benefit from their reputation,” he once said. “Trainers are scared off and the fields usually are small with little or no competition. They win a lot of races by default. Take Secretariat for instance, if he didn’t have a nitwit like me to put two horses in against him he would have won both the Whitney and Woodward by default. It sounds simple the way Jerkens puts it, but few trainers have had the knack of getting horses 110 percent on the days when it counted. In Prove Out’s case, the colt had bad ankles and other problems, and his trainer William J. “Buddy” Hirsch could do little with him. By August of his 4-year-old year, he had won only four races (a maiden and three allowance races) in 27 career starts. The longest distance he’d ever won at was 1 1/16 miles, and that came in his maiden victory. Jerkens had just sold Dreyfus’ Widener Handicap winner Vertee for a nice profit, and decided to take a chance on Prove Out, buying him for Dreyfus for $65,000. He began by concentrating on the colt’s ankles, tubbing them and poulticing them. He used a eucalyptus vaporizer to clear up his sinuses and applied linament to his shoulders. In short, he did everything he could to build him back up and alleviate any aches and pains that may have been bothering him. Jerkens knew Prove Out came from families that were trained hard and felt he might respond to hard training, much like Beau Purple.Prove Out also had a bad habit of lugging in, so Jerkens put his best exercise rider, Jimmy Rhoades, on him to try to teach him to keep a straight course. Two weeks after getting him, Jerkens ran him in a seven-furlong allowance race at Saratoga on Aug. 24. To prevent him from lugging in, he equipped the colt with a burr and put an inside cup on his blinker. Prove Out responded by defeating the quick-footed Cutlass and the 3-5 favorite Forego by 6 1/2 lengths in a track-record 1:21 flat. But after a poor performance in the Chesapeake Stakes at Bowie, in which he lugged again, hitting the rail, Jerkens became angry at the horse. In the morning, he equipped him with a severe run-out bit and turned it the opposite way. The bit had prongs that hit the side of the jaw, and Jerkens used it in the hope that during the race the burr would remind the horse of that bit hitting the side of his mouth and he would respond to it. Jerkens decided to take a shot and run Prove Out in the weight-for-age Woodward, even though he’d have to pick up 15 pounds off the Chesapeake run the week before, concede seven pounds to Secretariat, and stretch out from 1 1/16 miles to 1 1/2 miles. But this was Allen Jerkens, and the rest, as they, is history, as Prove Out easily defeated Big Red, running the second fastest mile and a half in Belmont history, on a sloppy track. Jerkens’ training of Prove for the two-mile Jockey Club Gold Cup went beyond unconventional. He breezed Prove Out a pair of slow miles, then breezed him three furlongs in :39 the Sunday before the race. The following morning, Prove Out worked a mile and a half in 2:39 3/5 with a final half in :49 1/5. Three days later, on the Thursday before the race, he galloped a mile and a half, after which he broke off into a dead run for a half-mile, which was timed in :47 2/5. He then galloped out an additional furlong in :12 3/5. In the Gold Cup, he ran Riva Ridge into the ground through rapid fractions, and despite ducking in again and bouncing off the rail, he came home his final quarter in :24 4/5 to defeat the top-class stayer Loud by 4 3/4 lengths His time was 3:20 flat, and to this day only Kelso has run a faster two miles in this country (3:19 1/5 and 3:19 4/5). While Secretariat was breaking track records in his works, Onion was breezing seven furlongs in a sluggish 1:31. “We went up to Saratoga to work Onion the Sunday before the race, and I ran into (jockey) Robyn Smith,” Jerkens said. “She asked to work Onion for me, but I told her it was too important a work. “She said to me, ‘Why, do you think I’m going to mess it up?’ So I let her work him and he went a half in :47 flat. Two days later, we ran him in a 6 1/2-furlong allowance race and he won by eight lengths in 1:15 1/5, breaking the track record. One could have retired with the money made on Jerkens’ horses who were running for second. Jimmy Rhodes exercised horses for Jerkens for nearly four decades, and had been around great horses, having exercised and broken Nashua and Bold Ruler for Sunny Jim Fitzsimmons. And who knows what he might have achieved if he wasn’t dealing mainly with obscure pedigrees all those years. Jerkens’ father, Joseph, was an officer in the Austrian cavalry of Emperor Joseph Franz, and his father before him owned and bred horses in the days of the immortal racemare Kincsem, so it is apparent that horses were in Jerkens’ blood. Joseph Jerkens came to America in 1908 and settled in Islip, Long Island, where Allen was born in 1929. He was galloping horses in the field at age 8 and kept a scrapbook on horses that he saved over the years, cutting out every horse picture he could find from magazines, newspapers, and advertisements. He loved horses so much he would sit on his porch just to see the milk horse go by. Throughout his life, Jerkens always spoke about his disdain for the whip. He eventually began operating riding academies and trained polo ponies and hunters before riding polo ponies on a regular basis. When his father started training Thoroughbreds as a hobby and rescuing animals that were about to be put down, Allen dropped out of high school at age 16 to follow the horses. He never stopped following them and loved being around them every day to the day he died. It was only appropriate that Jerkens’ first Thoroughbred was a horse he purchased from one of his father’s friends for $400 named Crack Time. Despite not having a trainer’s license at the time (his father wanted him to wait until he was 21), Jerkens got Crack Time to break his maiden and then win an overnight handicap before being claimed by Walter Kelley for $12,500. Jerkens has such amazing recall, he probably could have told you what Crack Time worked in before his races. He would often mention work times and fractions and final times of races run 20 or 30 years earlier, and they would always turn out to be right. 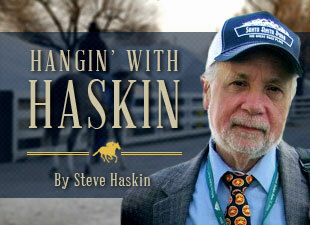 Jerkens leaves a void that will never be filled, not only in racing, but in life. He also leaves a treasure chest of memories. Jerkens of all people should have known better. He spent a lifetime disproving those words.